All anybody could talk about before Saturday’s Game Two of the NLDS in Washington, D.C. was the pitching match-up scheduled to start the game – San Francisco’s Tim Hudson versus Washington’s Jordan Zimmermann. Six hours and twenty-three minutes plus eighteen innings later, the longest game in recorded playoff history wrapped up and the San Francisco Giants advanced to game three with a 2-0 lead in the five-game series by beating the Nationals 2-1. Hudson – who is notorious for his successful and often dominant outings against the Nationals – was going to be a struggle for the Nats but Washington went into the game planning to be patient with him. On the other hand, Zimmermann was fresh and just six days removed from his historical no-hitter on the final day of the 2014 regular season. The match-up made the first nine innings what they were but the final nine innings played are the reason the evening’s game turned into the longest playoff game ever played. 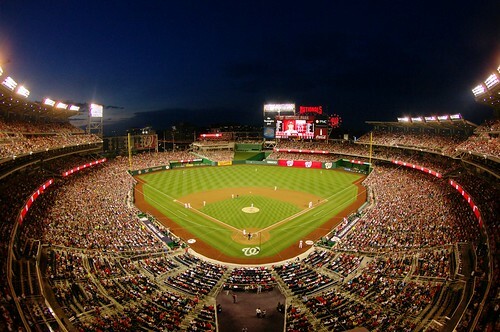 A crowd of 35,085 witnessed history at Nationals Park during game 162 of the 2014 regular season when right-handed starting pitcher Jordan Zimmermann threw the first no-hitter in the Washington Nationals’ nine year history to beat the Miami Marlins 1-0 on Sunday afternoon. The complete game outing was one the two-time All-Star never thought would ever happen, but it did. The Washington Nationals rebounded from Friday night’s lop-sided 10-3 loss that snapped their 10-run winning streak against the San Francisco Giants on Saturday by beating their visitors 6-2. Right-handed starter Jordan Zimmermann pitched a solid eight innings while throwing 107 pitches and 78 strikes. He gave up two runs on seven hits – including a Hunter Pence two-run homerun in the first inning – while striking out eight batters. Hours before being named to the 2014 National League All-Star team for the second time in two years, Washington Nationals right-handed starting pitcher Jordan Zimmermann threw a tough game against the Chicago Cubs and went on to win 2-1 on Sunday afternoon. Right-handed relief pitcher Tyler Clippard ended up with the official win but Zimmermann’s strong efforts helped ensure Chicago’s low run count. Zimmermann gave up seven hits over six innings while striking out five and walking one batter on 105 pitches (76 strikes). While the majority of Chicago’s 10 hits on the day came off of Zimmermann, the soon-to-be-announced All-Star pitcher and his defense held the Cubs in place. The night was almost overshadowed by the fact that outfielder Bryce Harper was back in the Washington lineup for the first time since April 25 but, instead, a five-run rally in the sixth inning against the Colorado Rockies highlighted what the Nationals are capable of if their starting nine stay off the disabled list. 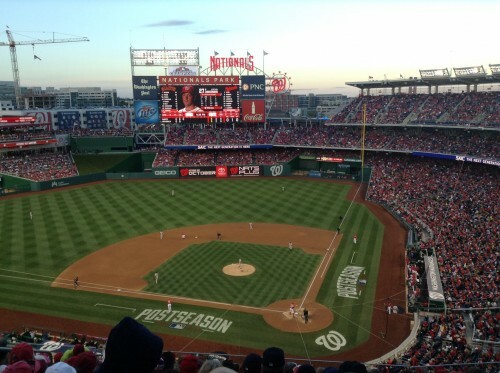 A few hundred people bore witness as the midnight hour crept just passed 1 a.m. at Nationals Parks on Tuesday morning as the Nats beat the visiting Los Angeles Dodgers 4-0. Due to rain, the game fell subject to a 3 hour and 17 minute rain delay starting in the middle of the 4th inning. The total time of the delay even ended up being longer than the total amount of playing time it took the Nats to win it. Both teams fielded some of their most reliable starting pitchers. Right-handed pitchers Zack Greinke and Jordan Zimmermann each performed prior to the rain forcing them out of the game. In fact, the two-run shutout Washington carried into the bottom of the eighth with them was recorded within the first two home team at-bats of the long, long night. Jordan Zimmermann became the first pitcher in the National League to reach 19 wins this season on Friday night as he led the Washington Nationals to a 8-0 complete game shutout victory over the Miami Marlins at Nationals Park. 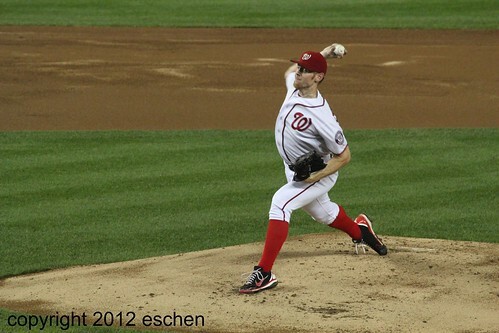 Zimmermann was as strong as he’s been all season and threw 107 pitches and 79 strikes. He gave up two hits, walked a batter, and struck out nine. By the ninth inning of Sunday afternoon’s 11-2 victory over the Philadelphia Phillies, the Washington Nationals fielded eight players who spend time at Triple-A Syracuse this season. It was a day where most everything went right for Washington, allowing Manager Davey Johnson to give some of the call-up kids a little playing time. Right-handed starting pitcher Jordan Zimmermann pitched seven strong innings and gave up seven hits and two runs while walking two, striking out seven and hitting a batter on 102 pitches (65 strikes). The Nationals started the second-half of the season on a rough note falling 3-2 against the Los Angeles Dodgers despite a strong seven innings from right-handed pitcher Stephen Strasburg on Friday night. Even Manager Davey Johnson appeared a bit deflated after his squad let the tie-game get away from them in the top of the ninth. “Tomorrow’s another day,” he said as he ended his post-game press conference. 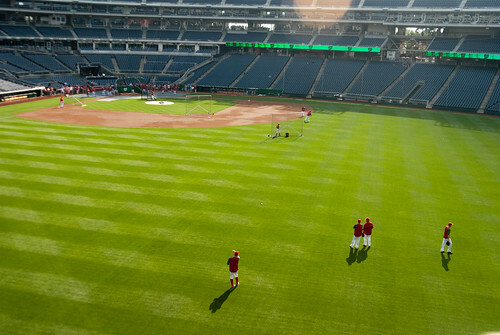 The Washington Nationals squeaked past the San Diego Padres with a 5-4 win on Saturday evening. Their line-up continued to work with the changes made this week but it took them a bit longer to tally up their run count when compared to the past few days. 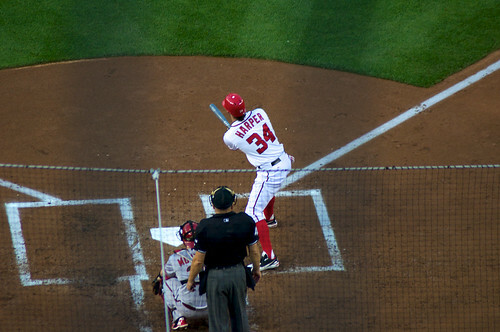 Outfielder Bryce Harper finally snapped his 0-for-19 hitless streak and had three RBIs in the game. Harper’s first RBI came in the third inning when he was walked by former Nat and San Diego starting pitcher Jason Marquis allowing catcher Kurt Suzuki to score making it a 1-0 ballgame. The Washington Nationals were three outs away from a one-run loss against the fourth place New York Mets on Tuesday night but Steve Lombardozzi saved the game by hitting a walk-off sacrifice fly into the glove of Mike Baxter in left field. His sacrifice fly sent first baseman Adam LaRoche around to score. Washington beat New York 3-2 in their first walk-off victory of the season. The Nats may have won the game but it was night in which the their offense continued to struggle. 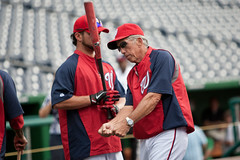 Manager Davey Johnson’s lineup managed four hits before their three-hit ninth inning rally. They were lucky enough to score early on a solo home run hit by shortstop Ian Desmond off right-handed pitcher Jeremy Hefner in the second inning — Desmond’s eighth home run of the season — but that’s the only run they’d tally up until the ninth inning. It was a game the Nationals could have won. A four-run first inning made the team’s offensive efforts look solid. But a short outing from starting pitcher Jordan Zimmermann helped this game fall into the hands of the St. Louis Cardinals lineup in a 10-9 loss. What started as Dan Uggla hesitating to make a routine play at second base turned into a 5-4 Nationals victory in the wee hours of Tuesday morning. It took four hours, twenty seven minutes, thirteen innings, and a fifty six minute rain delay, but Washington beat the Atlanta Braves and are now 30 games over .500. If you’re looking for consistency then look no further than RHP Jordan Zimmermann. The Nationals’ third starter in the rotation secured his seventh victory of the season Wednesday night with a 4-3 Washington win against New York, pushing him to a winning record of 7-6 thus far. This is the first time Zimmermann’s had a winning record since his 2009 rookie season. 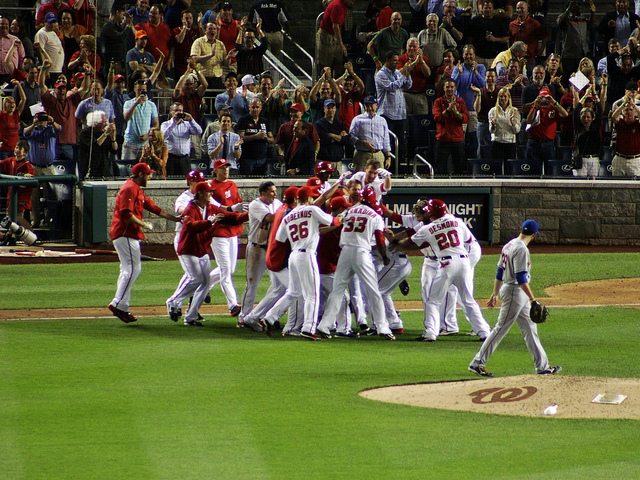 What appeared to be a quick and easy game for Nationals starting pitcher Jordan Zimmermann ended up being one of the most exciting extra-inning games of the 2012 season when Bryce Harper hit his first career walk-off – a single – to left field in the bottom of the twelfth inning aginst the New York Mets. Washington won 7-6 after battling through a four hour and fifteen minute contest and it was brutal. Over the course of the night, both teams’ benches and bullpens were depleted to the point where position players would have needed to fill the role on the mound. Nats fans were treated to not just one but two starting pitchers on the mound including Zimmermann and Ross Detwiler – Detwiler ended up with the win, by the way, with two innings of work in the game. What seemed to hold up the Nats eventual victory was Mets starter Chris Young who made his season debut, leaving men on base, and failing to come through in the clutch several times over before finally executing a combination resulting in runs scored. Young was effective, only giving up six hits and two earned runs of the three earned by Washington early on while throwing 52 strikes in 75 pitches. Zimmermann posted similar numbers on the night lasting six total innings and giving up five hits, two runs, no walks, five strikeouts and two homeruns. That’s what hurt him – giving up two homeruns in the sixth inning with the lead – bringing the score to 3-2 in favor of the Nats. Washington didn’t lose the lead in the sixth (they lost that honor in both the eighth and tenth innings) but that was the start of what ended up being a twelve-inning game. Coach Jim Lett’s bullpen got a full-group workout in during the game when Manager Davey Johnson started calling them over to the mound in the seventh inning. Left-hander Tom Gorzelanny threw a scoreless seventh before Stammen gave up two runs in the eigth after inheriting a runner from Sean Burnett’s stint just two batters earlier. Tyler Clippard walked the leadoff batter in the ninth before retiring the side. Once the game got to the eleventh, though, Johnson stuck with Detwiler and the Nats managed enough offense to win it. Michael Morse – who got his first hit of the season, a double in the fourth, since returning from the disabled list – did it again in the twelfth to leadoff and eventually scored on a passed ball at the plate. 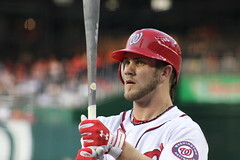 Then, as the story goes, 19-year-old phenom Bryce Harper recorded his first walf-off hit with a single to left field. Jesus Flores scores. Nats win 7-6 and resume their place atop the standings in the National League East. After the emotional Sturm und Drang that was this past weekend’s three-game series against the Phillies, the Washington Nationals needed a nice, quiet game that wouldn’t overly tax the bullpen. Luckily, they got just that kind of performance from Ross Detwiler, who allowed just one run on six hits over 6.2 innings as the Nationals defeated the Arizona Diamondbacks 4-1 Monday night at Nationals Park. On a night when most of the focus of the Washington brass and media was on Stephen Strasburg’s third rehab start with Class-A Hagerstown (for the record, Strasburg went three innings and allowed one earned run on two hits, walked one and struck out six while throwing 60 pitches in front of Nationals General Manager Mike Rizzo and principal owner Mark Lerner), the 25-year-old Detwiler continued to build on his impressive year, pitching into the seventh inning as a starter for the first time since June 20, 2009. How much of Detwiler’s improvement is genuine progress and how much is a product of mere year-to-year statistical variance is hard to gauge. His strikeouts per nine innings ratio has jumped to 6.61, up from 5.16 in 2010, though he only managed just three strikeouts Monday night after fanning seven in his previous start against Cincinnati. Detwiler’s also been getting more ground balls with his more effective sinker. 48.9 percent of all balls in play against him have been grounders this season, up from an even 43% in 2010. As a result, both Detwiler’s Fielding Independent Pitching (FIP) and expected Fielding Independant Pitching (xFIP) have dropped by more than a run from 2010 (the FIP has fallen from 5.64 to 4.54, while his xFIP has fallen from 4.97 to 3.96). But there’s no denying that the left-hander has gotten very lucky when it comes to stranding runners on base. Entering Monday night, Detwiler’s left on base percentage was an unsustainable 86.6 percent. Remarkably, he managed to bolster that number on Monday night, as Arizona stranded five of their seven runners while he was in the game. Indeed, the most crucial moment of Detwiler’s outing came in the top of sixth inning, when he allowed a single to Justin Upton and walked Chris Young to load the bases with two outs and Washington on top 4-0. Henry Rodriguez was warming up in the Washington bullpen, and on another night, Nationals manager Davey Johnson might have pulled the trigger on a pitching change. But this time, he only visited the mound to have a word with Detwiler, and his faith was rewarded when Detwiler induced Paul Goldschmidt to ground into an inning-ending force play. 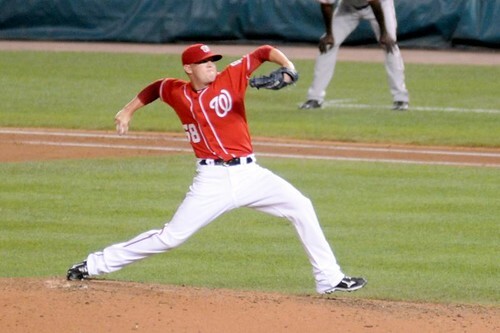 Along with Strasburg and Jordan Zimmermann, the development of Detwiler will be fascinating to watch. The good news is that the Nationals and their fans will have plenty of time to make a determination. Detwiler has one more full season before being eligible for arbitration, and he won’t be a full-fledged free-agent until after the 2015 campaign. On the other side of the coin, the Nationals offense didn’t make Arizona starter Joe Saunders work particularly hard (he had only thrown 90 pitches when he made way for a pinch-hitter after six innings), but the Nationals didn’t to have particular trouble hitting certain of his pitches. As it turned out, Saunders’ two-seam fastball was particularly ineffective, and it was responsible for all of Washington’s runs. In the bottom of the second, Jonny Gomes dropped a two-seamer into right field to drive in Jayson Werth for the first run of the game. Two innings later, after a Ryan Zimmerman infield single and a walk by Michael Morse, Werth hit another Saunders two-seamer quite a bit farther. The ball sailed into the front row of the right-field seats for a three-run home run that turned a 1-0 lead into a 4-0 cushion and capped off a fine night at the plate for Werth (2-for-4 with his other hit a pulled double into the left field corner in the second). The well-paid right fielder is very quietly having a fine second half to the season, with a .358 on-base percentage and a .778 OPS in 137 plate appearances since the All-Star Break entering Monday night’s game. While those numbers still don’t measure up to his outstanding statistics in Philadelphia, Nats fans can now expect, rather than hope, that Werth has got his feet under him in the nation’s capital. Two years ago, right-handed pitcher Jordan Zimmermann and catcher Jesus Flores founds themselves sidelined due to injury. Since then, Zimmermann has returned to the Nationals’ clubhouse after successful Tommy John surgery and Flores has regained his spot behind the plate which makes them regular fixtures in Washington’s 2011 25-man roster. Flores, although he fills a current slot on manager Davey Johnson’s lineup card due to Ivan Rodriguez being placed on the disabled list, is a player Johnson is proud of this season. He is also the reason the Nationals scored their first run in Thursday night’s 3-1 victory versus the Cincinnati Reds while Zimmermann got the necessary work done on the mound. It was Flores’ first homerun – a solo shot – since May 8, 2009. As the 4pm deadline crept ever closer the questions about a potential trade with the Minnesota Twins for CF Denard Span were met with silence. No one was talking about the trade. As the clock struck four, not a positive thing had been said about the prospects of the trade for four hours. Storen would remain a National, and entered the game to an ovation from the crowd of 25,307 on hand. Leading 2-1, Storen gave up a home run to Scott Hairston, his second of the day, to blow his fourth save this season. The Nationals went into the bottom of the ninth tied at two.